Groundwater is an important water resource for Wisconsin. The USGS collects information on the quality and quantity of Wisconsin's groundwater and conducts advanced modeling of groundwater flow and groundwater/surface-water systems. The USGS also evaluates the effects of water-use, land-use, and climate change on groundwater, surface-water, and the ecosystems that rely on them. The continuously bubbling water at the Frederick Springs sand boil at Pheasant Branch Conservatory in Middleton, Wis., is created groundwater flowing up through cracks in the overlying rock and sand. Groundwater is all the water below the land surface that fills the porous space in soil and rocks. The soil and rocks that store and transmit water are known as aquifers. The upper surface of the groundwater forms the water table. Groundwater is replenished (recharged) by rain and snowmelt that permeates through the soil and infiltrates downward to the aquifer. In Wisconsin, groundwater is the main source of drinking water for two-thirds of Wisconsin's residents, as well as for commercial, agricultural, and mining uses. How is groundwater connected to surface water? Nearly all surface-water features (streams, lakes, reservoirs, wetlands, and estuaries) interact with groundwater. These interactions take many forms. In Wisconsin, it is most typical that surface-water features gain water from ground-water systems. In certain circumstances however, a surface-water feature can act a source of ground-water recharge and can cause changes in ground-water quality. Because of the connection between surface and groundwater, withdrawal of water from streams can reduce the groundwater resource, or conversely, pumpage of groundwater can reduce the water that would typically flow to streams, lakes, or wetlands. Pollution of surface water can cause degradation of groundwater quality and conversely pollution of groundwater can degrade surface water. Effective land and water management requires a clear understanding of the linkages between groundwater and surface water as it applies to any given hydrologic setting. 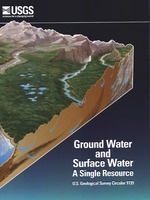 Learn more about groundwater and groundwater-related issues. Example chart showing daily groundwater level measurements (blue line) compared to historical daily mean (green). At this site, daily values have been well below the historical mean for the past two years, but have recently started to rebound. The USGS and its partners monitor groundwater levels in roughly a hundred of wells in Wisconsin. Groundwater-level data are collected and stored as either as continuous time-series data from automated recorders or discrete field water-level measurements. All Wisconsin data collected by the USGS and partners are stored and made available through the National Water Information System and Groundwater Watch. Additional partner data is available through the Wisconsin Active Water Level Network. The Wisconsin Modeling Center provides advanced computing resources to modelers to implement powerful new computational and analytical techniques. The Center trains others in the skills needed for future modeling projects and develops, implements, and disseminates state-of-the-art techniques and tools so that models are more effectively applied to today’s decision-making. The Soil-Water-Balance (SWB) model has been developed to allow estimates of potential recharge to be made quickly and easily. The code calculates components of the water balance at a daily time-step by means of a modified version of the Thornthwaite-Mather soil-moisture-balance approach. A summary of USGS resources and data related to drought hazards in Wisconsin. The PEST++ software suite is object-oriented universal computer code written in C++ that expands on and extends the algorithms included in PEST, a widely used parameter estimation code written in Fortran. PEST++ is designed to lower the barriers of entry for users and developers while providing efficient algorithms that can accommodate large, highly parameterized problems. Contacts: Randall J Hunt, Ph.D.
GENIE is a model-independent suite of programs that can be used to generally distribute, manage, and execute multiple model runs via the TCP/IP infrastructure. The suite consists of a file distribution interface, a run manage, a run executer, and a routine that can be compiled as part of a program and used to exchange model runs with the run manager. Winter, Thomas C.; Harvey, Judson W.; Franke, O. Lehn; Alley, William M.
Ground water and surface water; a single resource; 1998; CIR; 1139; Winter, Thomas C.; Harvey, Judson W.; Franke, O. Lehn; Alley, William M.
Data from wells, springs, test holes, tunnels, drains, and excavations in Wisconsin; well location data includes information such as latitude and longitude, well depth, and aquifer. Groundwater level data are collected and stored as either discrete field-water-level measurements or as continuous time-series data from automated recorders. The Bad River Groundwater Model Mapper accompanies the report "Groundwater-Surface Water Interactions in the Bad River Watershed, Wisconsin". The mapper displays model inputs such as aquifer recharge and hydraulic conductivity; outputs including water-table elevations, groundwater-flow directions, and stream baseflows; and the results of an analysis evaluating potential monitoring well locations. GENIE Version 2 is a model-independent suite of programs that can be used to generally distribute, manage, and execute multiple model runs via a TCP/IP network. The suite consists of a file distribution interface, a run manager, a run executer, and a routine that can be compiled as part of a program and used to exchange model runs with the run manager.